WELCOME TO THE BITTER CREEK MODELS WEBSITE. 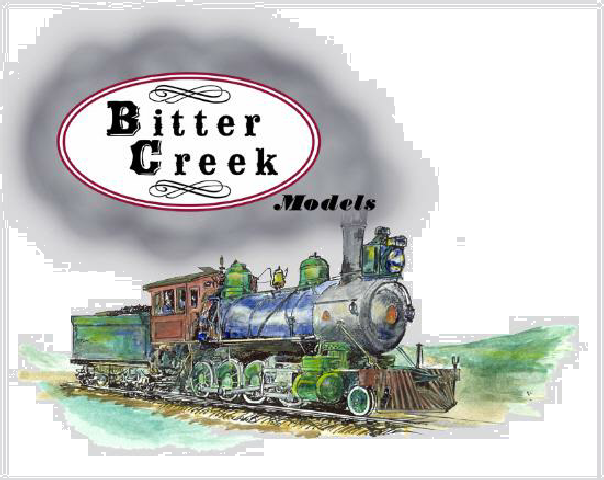 BITTER CREEK MODELS KITS, TRUCKS, AND DETAIL PARTS ARE MADE FOR THE ENJOYMENT OF HO SCALE MODEL RAILROADERS IN THE GRAND STYLE OF THE GOLDEN AGE OF RAILROADING, IN BOTH HO SCALE STANDARD AND NARROW GAUGE. UPDATE: JANUARY 2019 - THE B-4001 MANUAL GROUND THROWS ARE BACK IN PRODUCTION AND AVAILABLE AGAIN. AS I NO LONGER ACCEPT CREDIT CARDS FOR PAYMENT DIRECTLY, I HAVE ADDED THE ABILITY TO TAKE PAYMENTS FOR ORDERS THROUGH PAYPAL INVOICE. PLEASE SEE THE ORDER PAGE FOR HOW THIS WORKS. I TRUST THIS WILL PROVE CONVENIENT TO OUR CUSTOMERS. TIME TURN OF THE CENTURY CARS AND PARTS. THESE PRODUCTS ARE INTENDED FOR USE BY ADULT HOBBYISTS. SOME METAL CASTINGS CONTAIN LEAD AND MUST BE KEPT OUT OF THE REACH OF CHILDREN. DO NOT SMOKE OR EAT WHILE WORKING WITH METAL PARTS. WASH HANDS THOROUGHLY AFTER HANDLING AND WORKING WITH METAL CASTINGS. DISPOSE OF METAL FILINGS AND SHAVINGS PROPERLY.